A natural 2.4-mile loop departs from the 84th Avenue trailhead and includes the most interesting terrain at Upper Macatawa Natural Area as well as the barrier-free paved trail and scenic overlook. Its well marked and easy to follow and during the spring and fall migrations would provide amble opportunities to spot birds and waterfowl.The paved path is 10-feet wide and slopes gently up the ridge to the viewing point at no more than 5 percent grade to meet wheelchair accessibility requirements. The barrier-free trail alone makes for a round trip of a mile. 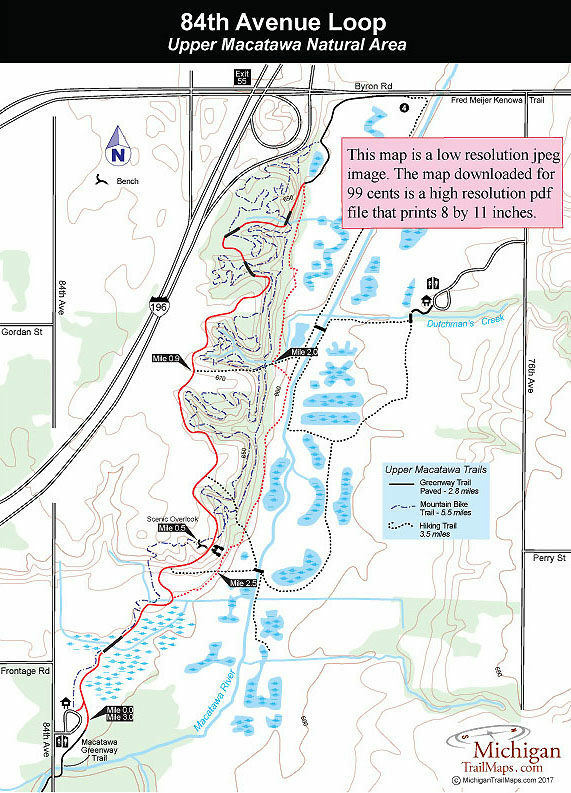 A natural 2.4-mile loop departs from the 84th Avenue trailhead and includes the most interesting terrain at Upper Macatawa Natural Area as well as the barrier-free paved trail and scenic overlook. It’s well marked and easy to follow and during the spring and fall migrations would provide amble opportunities to spot birds and waterfowl. The paved path is 10-feet wide and slopes gently up the ridge to the viewing point at no more than 5 percent grade to meet wheelchair accessibility requirements. The barrier-free trail alone makes for a round trip of a mile. The barrier-free trail departs from near the information kiosk at the 84th Avenue trailhead, crosses a long boardwalk between two wetland ponds and then sidles a third one before reaching post No. 1 in a third of a mile. All three wetlands have patches of open water while the trail allows you to search for waterfowl even if you’re not packing along binoculars. Beyond the post the paved path begins a gradual but steady ascent up the ridge that encloses the Upper Macatawa River floodplain, passing an unmarked junction and reaching the overlook at Mile 0.5. Three benches and its elevated perch makes it an ideal place to sit and gaze down at a handful of pools, the Macatawa River and the wetlands that surround them. A mowed lane takes over at the overlook and continues north through grassy meadows and around stands of hardwoods. A level trail leads past post No. 8 and then Post No. 7, the latter is at Mile 1 and close enough to I-196 you can hear semis rumbling by. The intrusion is short lived as the trail swings east to enter the woods for the first time and then makes a sharp descent off the ridge. The trail bottoms out at post No. 6 at Mile 1.4. Select the right-hand fork to return to the 84th Avenue trailhead. The trail soon is paralleling the Upper Macatawa, looking like a sluggish creek, and then within a quarter mile swings away from the river towards the base of the ridge. More wetland pools follow and at Mile 1.8 you reach post No. 2. Within 200 yards another junction is reached. To the east the trail leads to the bridge to post No. 10. To the west a trail climbs the ridge to the paved path. Continue south and quickly you’ll return to the paved trail and then the trailhead at Mile 2.4. 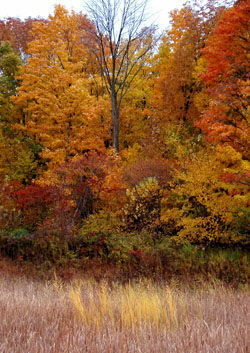 The Upper Macatawa Natural Area is located in Zeeland Township. To reach the 84th Avenue trailhead depart I-196 at exit 52 and head east on Adams Street and then north on 84th Avenue. The 76th Avenue trailhead is reached by departing I-196 at exit 55 and heading east on Byron Road on 76th Avenue.